in the heart of Sydney CBD near Martin Place. 5 mins walk from Wynyard station and St James station. We can not wait to see you at Lash Blossom and look forward to pampering you. Our team was excited to finally announce the launch of our lash extensions training program, designed to equip every aspiring beautician with the necessary skills, resources, and certifications to go out there and provide the world with beautiful lashes. Creating two different lash training courses that provide education to both beginners, and experienced lash technicians, we are ensuring that anyone, anywhere, is able to learn more about this refined craft. Having built up our very own reputation for providing the very best lash products and eyelash extensions today, we decided to create a curriculum that is based around our proprietary approach to all things lashes. Using our skilled technicians and their experienced approach to identifying the unique elements of each and every face, we are working with our trainees to impart this wisdom. 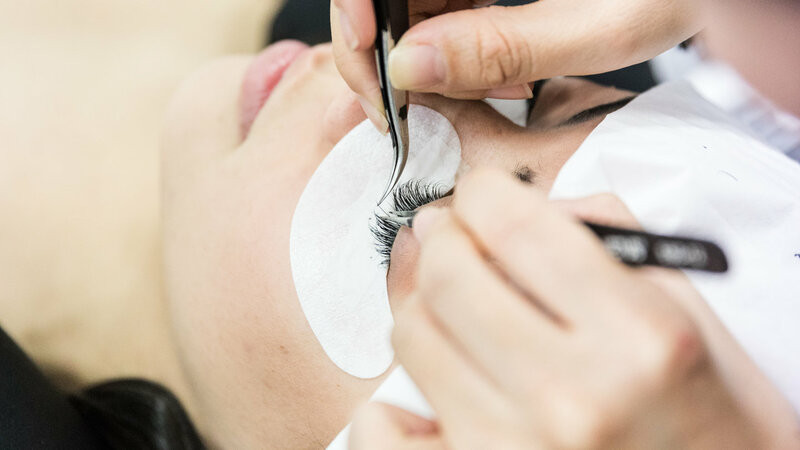 With our Beginner Course, you can count on an intro to lash extensions, a breakdown of the types of tools and products typically used, facial design and identifying the right lashes for each individual, lash application to mannequins, live models, aftercare, and infill. With both of our courses, we also provide lunch and snacks, as well as a lash kit that includes tweezers, glue, cream remover, mixed length lash, strip lashes, surgical tape, silicon tape, jade stone, eye patches, micro brushes, disposable mascara brush, disposable lip wands, palette 1, and alcohol wipes. Plus, once you’re done, we even include 3 months of ongoing support, ensuring you have access to our technicians to refine and hone in on your skill. Focusing specifically on Russian Volume and advanced lash extensions in this Master Class course, this class includes everything within the beginner course, and them some. Learn about Russian Volume, the difference between classic and Russian Volume, how to identify different lash styling techniques for clients, hands on training, and the list goes on. This is the perfect class for a lash technician looking to take their skill to the next level and master a variety of lash application techniques that will surely wow clients. So why should you choose to take one of our lash extensions courses? Just to further prove our legitimacy, Lash Blossom secured a feature in the Lifestyle Guide as the “go-to” place for lash extensions. Additionally, our shop has a perfect 5-star Google review rating, as well as a 5-star Yelp review rating, providing you with plenty of testimonials for you to vet before you consider our training program. Plus, we absolutely love what we do here at Lash Blossom. We believe that eyes are the windows to the soul, which is why lashes serve such a special role on your face. Therefore, we know our craft is important. We want you to know how to properly integrate lash extensions with every kind of client, and that starts with one of our brand new courses! WHAT IS A LASH LIFT? AND OUR TOP 6 BENEFITS! 10 GREAT REASONS WHY YOU NEED LASH EXTENSIONS!